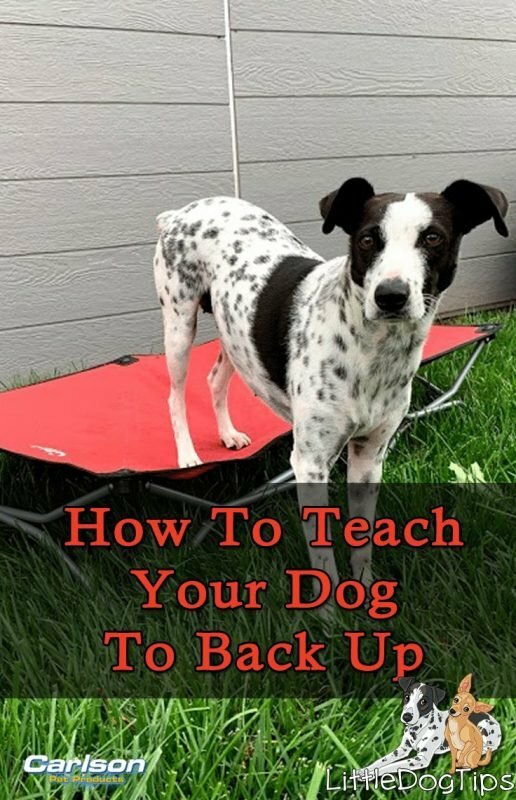 Whether your goal is teach your dog to back it up like a Tonka truck… or set the foundation for complex hind end awareness-based tricks – you can teach the “back up” cue using a prop like our portable pet cot from Carlson Pet Products. This post is sponsored by Carlson Pet. I was compensated and received the shown product in exchange for a feature – though I only collaborate with brands that I love and recommend! Thanks for your support. “Back up” teaches hind end awareness – your dog’s ability to consciously move her back legs even though she can’t see them. It also improves your dog’s dexterity and flexibility. She’ll be both mentally and physically challenged when she’s learning this fun trick, and your family and friends will love watching her! At first, I thought I’d have to teach Cow this trick by stepping in front of her so she’d naturally back away from me. But Cow loves to be as close to me as possible. I wouldn’t want to teach her to back up by invading on her personal space and making her feel so uncomfortable that she retreats. For shy dogs, this could be pretty intimidating, and could even discourage them from learning. As it turns out, there’s many hands-off methods to teaching back up. You can drop a treat into a tight space and mark/reward your dog when she backs out of that space. You can also use a visual, tactile cue (like our cot) that your dog can use as a target to hit with her hind legs. I found that this was a quick way to communicate to Cow what I wanted her to do: back up while facing me. I personally never got into a habit of using a clicker. I can never seem to find them when it’s time to train. It’s just as effective to say, “yes!” or “good!” when your dog does something right. The way you deliver treats will shape the behavior. If you want your dog to stay in position, bring the treat to her mouth or toss it to her. If you want her to step forward, you can drop a treat at your feet. I often give Cow a treat when she steps forward and when she steps backwards to keep the game fun and exciting. If you’re using a cot, you may need to set it up outside on some grass, indoors on a carpet, or against a wall to keep it from sliding around. You can even set it up in a corner with a barrier on the exposed side to create a tight space that will make it easier to keep your dog from moving the wrong way. Lure your dog into position: front paws on ground, hind paws on target. Mark/reward her big time just for being in this position – give her three big treats and encourage her to stay until the next step. Drop a treat right by her front paws, just far away enough that she must start to take one hind paw off the target to reach it. As soon as she gets that treat, use another to guide her back into the first position. Reward any hint of her grasping backwards with her hind paw, anything that resembles that “back up” motion. This is a tough trick, so your dog might get confused. Start over in the first position. 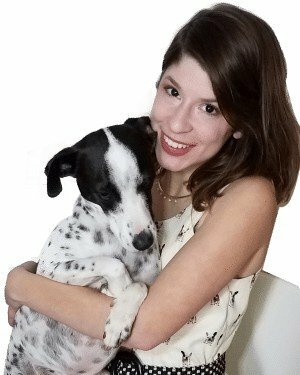 Heavily reward anything that comes close to step back to keep your dog motivated until she starts to get the idea. When you notice her stepping on and off the target with that one hind paw, try having her step completely off the cot, and see if she’ll step backwards onto it again. 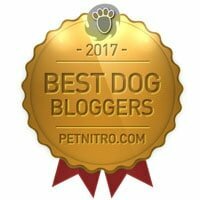 As she gets better and better, encourage your dog to step forward another foot, then another, until she’s able to take a few steps backwards onto the cot. During our first ten-minute session, Cow was just starting to take small steps on and off the cot with one foot. Sometimes she seemed to get it, but it may have been by coincidence. Other times, she turned around and walked in the wrong direction, so we had to start over in the first position. By the third or fourth session, she was sure-footed and able to step on and off the cot up to 3 feet away. By the fifth and sixth session, we were able to try with other props, like a couch with the cushion removed, which is just slightly taller than the cot. She can also back up onto her cot from across the room. Your dog might be faster or slower. If you or your dog are getting frustrated or confused, end the training session on a good note with an easy trick like “sit”, and then wait a few days before trying again. You don’t have to train consistently to see results. In fact, it’s better to take breaks, work on different tricks, and revisit the “back up” with a fresh mind. Once your dog masters the “back up,” you can have a lot of fun with it, but getting there can be difficult. Keep finding ways to make this easier for your dog. You might want to start with something even smaller, like a rug, and you’ll always need to concentrate on what your dog is doing right so she’ll stay motivated. I love this cot for taking to the dog beach, it’s the perfect spot for the dogs to dry off without getting sand on their bellies. When it’s not being used for tricks or coming with us to the beach, Matilda and Cow use it every day to relax at home. It’s Cow’s favorite spot for chewing on her toys while looking out the window. Carlson makes good stuff. Those cots are nice. Cow is very cute practicing her new skills. Cow looks adorable practicing backing up,and she did such a great job! That cot looks really sturdy – I had never heard of Carlson products before. Thanks for sharing your adorable video. Great post! My older dog knows how to back up but my youngest needs more practice. He’s a bit slower when it comes to learning new things, although he does get most tricks eventually. Great video and that cot looks great. We have one that looks very similar, although I think it’s a different brand. I would never have thought to use something like this but it works brilliantly. That would be a great trick to help with photo shoots. I can’t tell you how many times my dogs inch forwards and then I have to reposition them all over. I’m going to give this a try! I’m glad to hear that this product helped with your training. 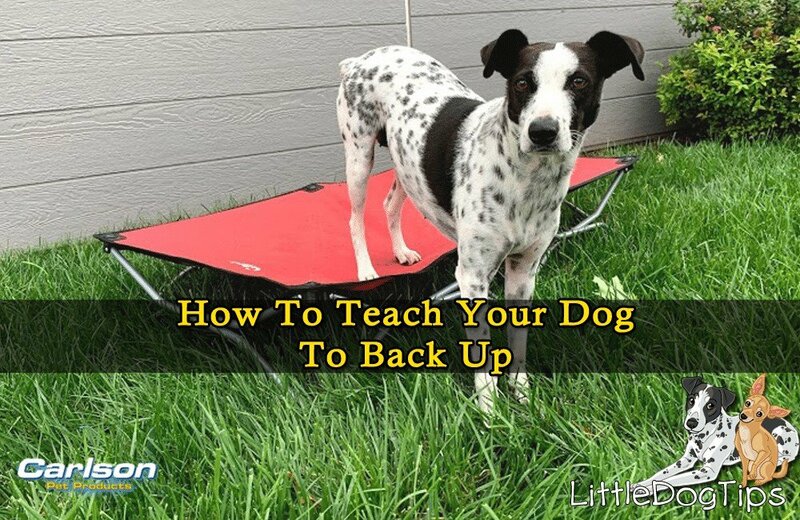 I didn’t realize there was a need to teach “backing up” to dogs. What is the main purpose? Great info! I did teach my Huskies to “back up,” with one who does it immediately, while the others (I swear they sigh before they do it) take a few extra seconds. I find it so helpful when they all bottleneck the door to get out and I need to get to the door and open it! I’ve always been intrigued by the cots…Cow is such a good model! I love the idea of this ‘hands off’ training method. We still have A LOT of work to do with our PM rescue, Jack. When he wants to be cuddly, it’s amazing. It’s always on his terms, though. We don’t want him to feel intimidated. Thanks for another great training tip! We had quite a time when Cookie needed to learn backing up for rehab purposes. She doesn’t like moving backward. But we managed.